I learned how to cook split peas many years ago but they were always with the green split peas. I never even knew that there are “yellow” split peas until fairly recently. For years I cooked green split peas in Florida. I really do not remember them being well known in Ohio; at least in my family and through my friends. In recent years, I discovered that yellow split peas are also very popular. Through acquaintances I found that these yellow ones serve as a regular meal in North and South Carolina. When I tasted them, I thought they were very good; a little lighter in flavor but equally as tasty. These are known to be a better choice in the Northern European countries. Learning how to cook split peas, it is like cooking other dried legumes. Both the green and yellow split peas are treated the same when cooking. Like other legumes you can purchase split peas in many different quantities. Because many recipes can be made from these peas, I prefer to purchase them in larger quantities. They are cheap to buy and a great item to add to the menu when trying to feed a family. 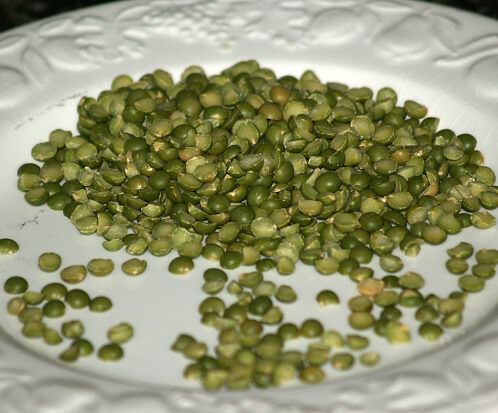 If you are going to learn how to cook split peas it will be good to also know that they offer many health benefits. The high content in fiber is known to help reduce cholesterol and manage blood sugar. Dried peas are a good source of potassium and other nutrients. Because split peas are dried and have a very long shelf life, many people keep them as a backup for when they run short on other food. As I was learning how to cook split peas, I found that they do cook a little quicker than other legumes. To cook split peas inspect and remove any debris from them. Rinse and then soak overnight in fresh water. In the morning I rinse them again, put in pot and cover with fresh water. Cover the pot with a lid and bring to a boil. Reduce the heat and simmer until they are tender. Even though I prefer to soak overnight, I have cooked them without soaking. It took a little longer to cook but cooked better than dried beans do. NOTE: Cooked split peas should be “creamy” thick (Like they have been processed in a blender) to serve. NOTE: When soaking dried split peas, place peas in a large container and cover them with water about 2 inches above the peas. NOTE: When cooking split peas, they absorb the liquid up quickly so keep a check to make sure they do not dry out and scorch. If you have leftovers, you may need to add a little more liquid when heating. For recipes like the “split pea spread” below other ingredients like mayonnaise might make them moist enough. I have learned how to cook split peas by simply seasoning with salt and pepper. 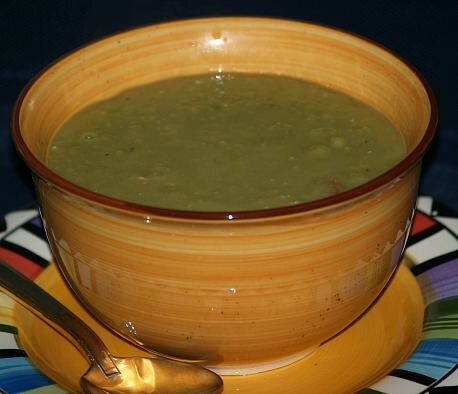 This is fine for when I use the split peas for making other recipes but to eat them as a soup, I prefer to cook them with a little chopped onion, ham bone and salt and pepper. I always cook plenty when I cook them because they can be added to make so many other recipes. Learn how to cook split peas to make a delicious appetizer spread. OPTION: If thinning is necessary for spreading consistency add olive oil. Refrigerate for a couple hours before serving; serve with small pieces pita bread. Add onion and cook 5 minutes or until tender stirring occasionally. Stir in 2 cups of water, split peas, bay leaf and mustard; bring to a boil. Reduce heat to medium low; simmer 45 minutes until peas are tender stirring occasionally. Stir in green peas, salt and pepper; cover and cook 10 minutes until green peas are tender. REMOVE bay leaf and discard; put mixture in processor until smooth. Garnish each serving with dollop of sour cream. Learn how to cook split peas in a spicy casserole dish. Wash dried peas; cover with cold water and soak overnight. Place ½ of onion and ½ of the pork in bottom of large greased casserole baking dish. Rinse peas and place on top of onion and pork; place remaining onion and pork on top of the beans. Mix chicken broth with the brown sugar, catsup, ginger, cinnamon, pepper and dry mustard; pour over top. Cover and bake about 1 ½ to 2 hours (Check so they do not dry out) until peas are tender. Uncover last few minutes to brown slightly. Cut ham into 1 inch cubes; combine with split peas, salt, basil, onion, pepper and water in large Dutch oven. Bring to a boil; REDUCE HEAT, cover and simmer about 1 hour; stir in celery and carrots. Continue simmering covered about ½ to 1 hour until thick and vegetables are tender. Wash and clean dried peas; place in saucepan and cover with cold water. Bring to a boil and boil 2 minutes; remove from heat, cover and let set for 2 hours. Bring peas to a boil again and simmer for 30 minutes; drain thoroughly. Heat butter in large saucepan over low heat; sauté chopped vegetables for 10 minutes. Add chicken broth and garlic to the pan; bring to a boil and add the split peas. Season to taste; bring back to boil and simmer 1 hour. Melt remaining butter in a skillet; fry slices of bread until crisp and golden. Remove cloves of garlic from soup; serve with toast. Combine peas, boiling water and bay leaf in a large Dutch oven. Bring to a boil; reduce heat, cover and simmer 1 hour stirring occasionally. Add pork, onion, marjoram, thyme and ginger; bring to a boil. Reduce heat, cover and simmer for 1 hour and 15 minutes. Stir occasionally until peas and pork are tender. Stir in salt/ pepper and ½ cup of water; remove pork. Strain soup through coarse strainer; pour back into Dutch oven. Reheat soup over low heat; slice pork and serve with bowls of soup. Wash and clean peas; cover with cold water and soak overnight. Drain and place in large pot; cover with fresh cold water 1 inch above the peas. Bring to a boil; reduce heat, cover and simmer about 1 hour. In a skillet heat oil; sauté onion and bell pepper until soft. Add onion mixture, garlic, cumin, sugar, salt, pepper and cayenne to the peas. Cook about 30 minutes or until beans are thickened; serve as side dish. NOTE: Split peas should be thick; if too thick add a little water to thin. 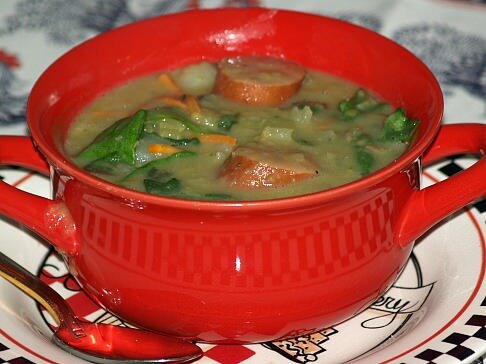 Learn how to cook split peas to make my favorite soup with kale. Melt butter in large Dutch oven; sauté onion and celery until tender. Add carrot, potatoes and chicken broth; cook until tender. Add remaining ingredients stirring to blend well; bring to a simmer.